Favorite programs This is the left side of the Start menu, which appears by default with a white background. This side includes the fixed Internet and E-mail icons at the top, and below them are shortcut icons for the six programs that you’ve used most frequently. Built-in features This is the right side of the Start menu, which appears by default with a light blue background. 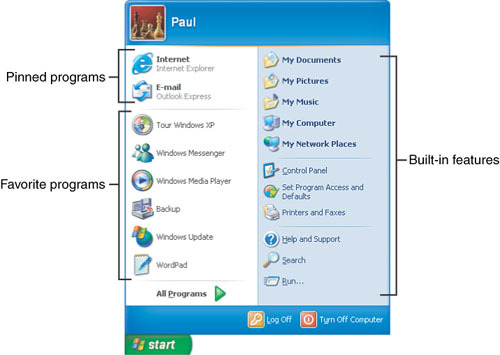 It contains icons for various built-in Windows XP features. Figure 1. The Start menu lists favorite programs on the left and built-in icons for XP features on the right. Open the Control Panel’s Taskbar and Start Menu icon. The Taskbar and Start Menu Properties dialog box appears. A quick way to go directly to the Start Menu tab is to right-click either the Start button or an empty section of the Start menu and then click Properties. Make sure that the Start Menu option is activated and then click the Customize button to its right. 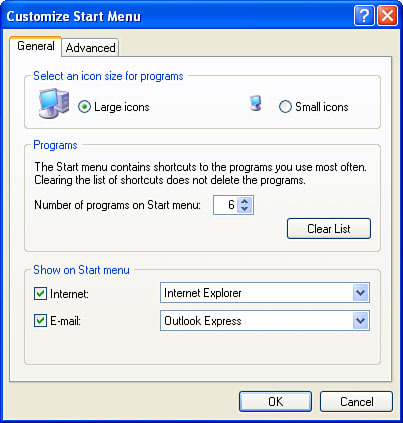 The Customize Start Menu dialog box appears, as shown in Figure 2. Figure 2. Use the Customize Start Menu dialog box to set the maximum number of shortcut icons that appear in the Start menu’s list of favorite programs. Use the Number of Programs on Start Menu spin box to specify the number of favorite programs you want to display. If you want to start over with a fresh list of frequent programs, click the Clear List button. If you need to get rid of only one or two icons from the Start menu’s frequent programs list, display the Start menu, right-click an icon you want to delete, and then click Remove from This List. If you don’t think you have enough screen space to display all the icons, activate the Small Icons option. This significantly reduces the amount of space each icon takes up on the Start menu. Here, program.exe is the name of the program’s executable file. (If the key doesn’t exist, create it.) Create a string value called NoStartPage and set its value to the null string ("").  You can also do this via Tweak UI. Open the Taskbar, XP Start Menu branch and deactivate the check boxes for the programs that you don’t want to appear on the Start menu.